Imagine seeing the World with only a little or completely without your beloved eyesight! Dark, daunting and depressive thoughts? But can we try to see a sightless world from a different perspective? Imagine seeing without colours, would it cause less racial discrimination? Or not looking at physical deformities, would it help us to hear a person’s inner beauty? Will we learn not to judge a book by looking at its cover in a World that often believe and judge in what they see? 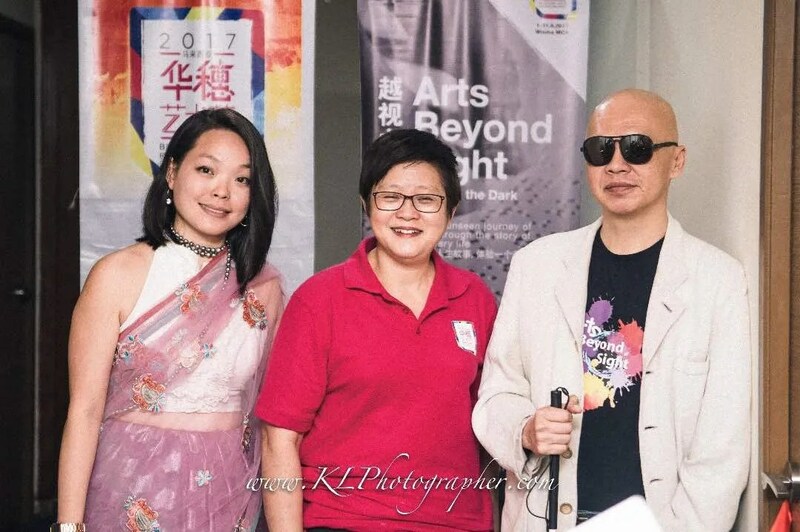 Welcome to Arts Beyond Sight, an experiential journey of seeing the creative beauty of Arts without your sight! Visitors will be guided by professionally trained visually impaired Guide thru a 30 minutes of Touching, Smelling, Hearing and Tasting the beauty of Arts seen from a non visual perspective! 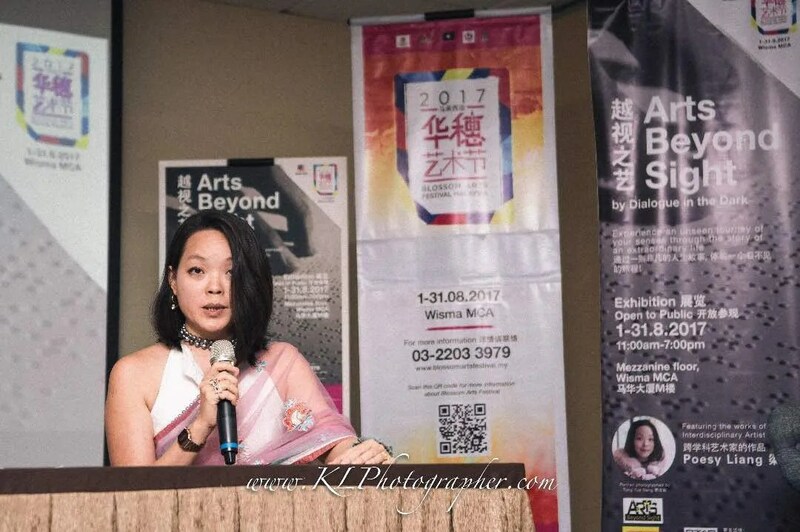 Poesy Liang 梁小詩 is an artist, mastering 3 classical Chinese mediums since 6yo. She was discovered as Levi’s 501 girl at the age of 14. As a teenager, Poesy feels at home in a film set – she has worked closely with top commercial filmmakers, leading agencies & prestigious brands – a familiar face in the broadcasting world from high school through architectural school till her late 20s. She was paralysed twice. In her quest to heal, Poesy experimented with her social media to raise compassion, kindness and empathy, which won her numerous humanitarian awards & recognition. After many reinventions, Poesy re-emerged an interdisciplinary artist who is busy in 3 continents. Due to many requests to turn her life into a movie, she has opted to tell her story through a very short “Poesy Anime” which is still in production. This exhibition is Poesy’s self-portrait in the dark which borrows some materials from “Poesy Anime” never shown to the public and showcases other unpublished creative skills. All your senses will be activated except for your sight. This exhibition is suitable for children from 12 years old up. I’d like everyone to relax, don’t look at your phone, close your eyes. Relax, it’s okay. Close them. Let your eyes take a minute break. Now, listen to the sound of my voice. Can you tell anything from how I sound? Listen to the sounds around you. Can you tell who is sitting or standing? Slouching, eating or yawning? Listen to the sounds outside. What do you hear? Is there a lot of traffic? Trucks? Bikes? For some people, this is their entire life. And for what you might experience as an inconvenience, some might consider a super power. The ability to hear sounds and surroundings in a way like no other. Today, I’ll be talking about the blind and visually impaired. While I’m a person with sight, I’ve come to admire and become close with people in the blind community getting to know them through their stories. From judgement to struggles to joys. First, I’d like to thank YB for officiating my exhibition. Thank you to the members of the media for taking the time to be here. Today is an uncommon day for me because it is not often that I find myself seated next to a politician in a press conference. I’m an artist, and often more focused on expression than governance. So, it’s great that we are here today, united for the arts & humanity and I am here for a cause that is close to my heart which is to raise empathy for the blind & visually impaired. It is an honor to be the solo artist for Art Beyond Sight this year. Mr Stevens Chan of Dialogue in the Dark was first connected to me by the Singapore International Foundation. I’d like to thank them both for this opportunity. For those who hasn’t met me yet, I will offer a brief introduction of why I am here. I am a founder of a social experiment started on Facebook 11 years ago. It was a movement based on random acts of kindness, I wrote the policy with 4 simple rules – No fundraising, No Commerce, No Religion & No Politics. My movement spread to more than 20 countries, in Malaysia alone I throw an average of 1200 volunteer events per year for the first 6 years. The activities were run without a production budget and were designed for volunteers who were willing to do random acts of kindness and to serve the marginalised community. It was my first of many portfolios of a new kind of art performance. A senior curator who is also the Commissioner of the Arts for the City of Dallas coined my work as the art of life and it gained me many invitations to different countries, to create more movements & to grace the stage of global humanitarian summits at the United Nations in New York. As an artist, you can say that kindness is my art, despite my preceding reputation of a wicked human mind. I have always been curious to work with the blind. My first project with the blind was exactly 7 years ago in San Francisco. That summer I persuaded a quartet of big named jazz singers & musicians to perform a free concert for 100 blind audience inside a borrowed canteen. The immense reward from that humble project brought me clarity, it was the kind of clarity about life that you will experience when you gain new perspective not with your eyes but with your consciousness. That perspective came to me when I tried to empathise what it was to be blind. Ever since then, I have held a strong belief that the blind can often see a life situation far more clearly than someone who has eyesight. More often that not, our eyesight causes confusion because it makes us judgmental human beings. The eyes receive images, which communicate messages that may or may not be intended. We may be influenced by what we see, and then our perceptions and attitudes are impacted. But, take that sight away, and the distraction of stereotype changes completely. Our intuition becomes sharper. 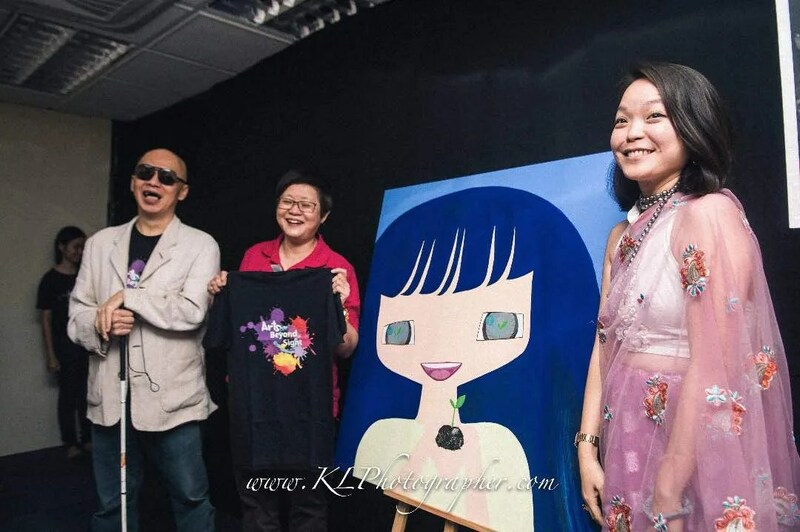 When Mr. Stevens Chan approached me about doing this exhibition, I saw the opportunity of gifting this extraordinary dimension to the Malaysian public. While normally, I charge a fee for my public speaking engagements and exhibitions, for this it was different. I was compelled to join the cause. Today is uncommon also because the exhibition we are launching is my self-portrait in the dark. If you were observant, I use a mobility scooter to get around, my story has been told many times in the media but not the way I am about to share with you today. A few years ago in HK, a prominent collector of Chinese contemporary art from Switzerland gave me an important piece of career advise, he told me to share my life story. What he said to me was no different to what the agents, book publishers and film makers said to me over the decades, but speaking to someone who understood & supported artists inspired me to write my own rules. I did not want a 100-minute movie nor a boring old book. So 4 years ago, I started to draw a short animation film titled Poesy Anime slated for global release on social media. This short movie was only going to be 5 minutes long, I wanted it to be short since our general attention span these days are also short. Today you will be hearing the soundtrack of this film before anyone else. This script has gone round the globe and it took 14 writers 2 years to shorten my life story into 5 minutes. To shape the narration, we had a scriptwriter who consults for Disney, a film school professor from a Texas university, while others were media producers & journalists who had interviewed me in great lengths. Needless to say, I had to personally sit through many hours of counseling. I self-fund this production by selling my art work, painting on the sidewalks in Europe & travelling between 3 continents each year – just painting my way. The final copy of this soundtrack was recorded in London last year with a special music director who was also the last music director of the late great songstress Teresa Teng. To date, I have spent close to USD$22,000 on this production with most of the top professionals offering their services pro bono and now I am offering this exhibition to you for free. It is my birthday and we can consider it my gift to my home country Malaysia. When you enter that pitch black room later, know that you are sharpening your senses by temporarily taking away your sight. You are not pretending to be disabled, but instead think about expanding your abilities in that darkness. Rest your eyes and let your consciousness take over. I hope you will gain insights from your experience and tell all your friends about it on social media, traditional media and please come back again with friends and their teenage children, the exhibition is suitable for children 12 years upwards. And it will be open from 11 to 7 everyday until Hari Merdeka. Don’t waste this opportunity. Before I end, I would like to thank the blind guides who will be walking you through the dark room experience. They will only be earning a small allowance each day for an entire month to present this experience to you. To contribute to their dedicated service, please donate to Dialogue in the Dark. You will see the main character of Poesy Anime printed on the tshirts for sale, those are also to help raise funds for the cause. I’d like to leave you with a favorite quote of mine, “If you ever find yourself in complete darkness, you are better off being led to the end of the tunnel by someone blind.” So go forth and have a unique experience that now can only belong to you.